Eating out is everyone's favourite pastime! If you’re visiting Singapore, you’re in luck as the island is brimming with a great variety of cheap and tasty food. As Singapore is a multi-cultural country, each one adds their own flavours to the vast assortment of street food. With hundreds of such hawker centres spread across Singapore and thousands of stalls selling an array of different dishes; finding a gem amongst the thousands is a challenge. There are varieties of dishes you must try out in Singapore. If I had to write about all of them, it would take months to finish. So here is a check-list of the best local street food to feast on in Singapore. The best time to savour on the food here is by sitting at the terrace area in the morning with the other foodies. The Ya Kun Kaya Toast restaurant (located in the heart of Chinatown) serves mouth-watering standard breakfast platter since 1944. Get a plate of toast filled with kaya coconut jam, two eggs and a cup of dense coffee, magically filtered through a strange-looking coffee machine. They also add a big dose of condensed milk, delicious but sweet. Worth giving it a shot! 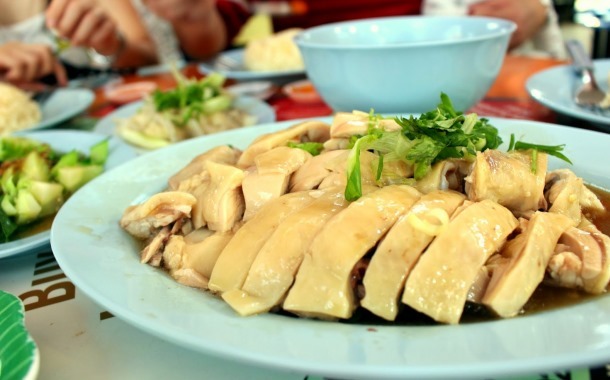 One of the most famous Hainanese chicken rice stalls in Singapore is Tian Tian. With long queues forming in front of the stall everyday, it is no wonder that this is the most favourite food corner for many locals. The rice here is so good that you can eat it on its own without any curry to go along. The platter consists of tender steamed chicken served with slightly cooled, rice, cucumber, coriander, a homemade chili sauce and bowl of chicken broth. Try out the Hainanese rice, light, smooth and slightly buttery with just a hint of garlic. Indulge in a taste that develops delightfully and engages with all your senses. One of the best things to not miss is a bowl of Laksa here. The fluffy bean curd puffs, bean sprouts, cockles, shrimp, fish sticks and noodles are served in a coconut curry soup with a spoonful of crushed coriander. When it comes to Peranakan style or more, the place has to be Katong! The Laksa gravy is still one of the best. You also get to choose which type of noodle you want and whether you want it in a rich stock soup or dry form. You even have a choice of prawns and extra meat. I have always preferred thin white noodles in the soup with large prawns. Even if you were never a fan of cakes and pastries, this lychee martini cake from Pine Garden's Cakes at Ang Mo Kio Ave 10 will leave you with a lasting impression that you would want to return for more. Topped with fresh lychee, a piece of this cake comes with smooth sponge cake layered with fragrant cream and filled with small lychee pieces coated with martini. What I loved the most is its irresistible sweetness that leaves a lingering aftertaste. From local flavours like durian and red bean to the classic vanilla and chocolate, you can choose to have your ice cream wrapped in bread or between wafers. The ice cream street stalls are definitely the perfect treat after a long day! Wrapped in rainbow bread, wafer or cup indulge, just enjoy the different flavours. To enjoy a seamless journey, book a Singapore visa and experience Singapore like never before.